Yamaha Arius Digital Pianos are the latest trends of digital pianos to hit the market in recent years. Not only do they use the most advanced technology to produce high quality sounds but also come with the best acoustic feel. These wide range of pianos come along with headphone jacks, digital recording, and a variety of different voices to choose from. The Yamaha Arius series fall into different groups depending on the quality and features. The Yamaha Arius YDP 162 has a Graded Hammer (GH) with a weighted action. This weighted action has a heavier touch on the low end and a lighter touch in the high end. This feature enables an excellent key stability, repetition and response which in turn produce high quality sound and pitch. It has a synthetic Ivory set of keys which top the tactile surface on the white keys. This is a great, advantageous feature which enables easy grip on the keys. 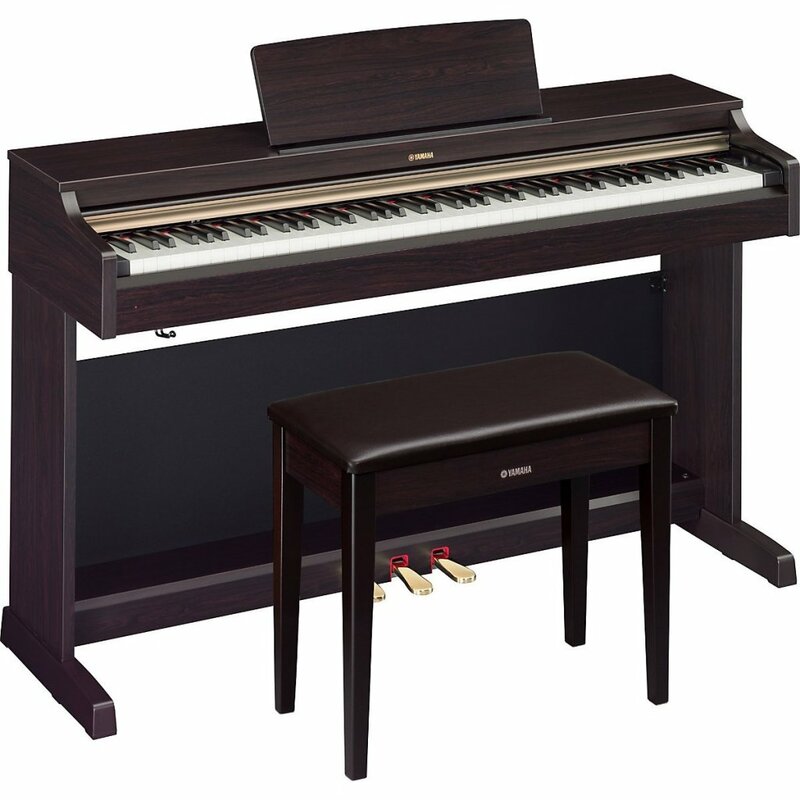 The Yamaha 162 series has been developed and sampled from the Yamaha CFIIIS concert grand. This allows the piano to produce the purest sound courtesy of the CF engine. This makes the 162 series a better make when compared to the Yamaha Arius 142 and 161 series which both use the Dynamic Stereo Sampling with 128 note polyphony. The Yamaha Arius YDP 162 stands at 33 inches tall which is much taller than other models like the 140 and 161. This tall height is a great advantage since it gives the user a comfortable posture when playing it as well as allowing a much more substantial upright look to its cabinet. It has an acoustic optimizer which physically adjusts the acoustic flow, hence producing one of the best acoustic experiences that you can find. This acoustic flow controls resonances as well as enriching the overall piano sound. However, the acoustic sound is only produced when the piano has been set in a special design and position. This is one of the best pianos for any beginner. This can be attributed to the fact that it uses an in-built 2 track recorder which enables you to practice using one hand at a time. A great feature and an advantage is the fact that its surface absorbs the moisture produced by your fingers while. This in turn enables you to play the piano with the greatest comfort ever and for the longest period of time. The 162 series comes with 10 demo songs which allows the user to select between vibraphone, harpsichords, electric piano or the church organs. It also has 50 piano preset songs, hence giving you a variety of options on what type of preset song to practice on. The Yamaha Arius YDP 162 has the recording function which allows you to record and play later. This is a great advantage over other Yamaha Arius series such as the YDP 161, which lacks the recording capability. It also has USB capability which allows you to connect the piano to your personal computer for more advanced play and recording. The keys are touch sensitive and come with different settings. This means that you can select either soft, medium or hard settings to match your preferred finger strength as well as playing style. Expert pianists who don’t require headphones to listen to their playing skills may find the 20W speakers weak in producing quality sound. The 162 series also lacks a LED display to show settings and preferences. Overall, the Yamaha Arius YDP 162 is great value for money, for both beginners and advanced pianists.